I like dessert a lot. I blame (but really am grateful to) my mother, a woman who craved sugar so often during her pregnancy that she nearly gave herself gestational diabetes. Am I saying the sugar cravings of the mother are the sugar cravings of the unborn child? It’s a gray area, but yes. Cake is the dessert I remember loving first. As a kid, I would demand a corner piece on birthdays, Father’s Days, the day Mr. Clancy retired from Butler Jr. High, et al. for what I assume are obvious reasons, but maybe middle school you didn’t think about cake as much as middle school me (corner pieces have three times as much frosting as any other piece ). Over the years, my dessert palate has, of course, expanded—cookies now reign supreme in my personal hierarchy, but one particular dessert I’ve come to love, appreciate, and rank just below cookies and cake is frozen yogurt. And it’s all thanks to L.A.
FroYo’s notoriety in Los Angeles is comparable to the idea of celebrity: Everyone’s heard of it; it’s everywhere, but sometimes you have to look really hard for the good ones; Paparazzi often photograph real celebrities holding it. We recently ranked the 51 best sweets in Los Angeles, and the list is void of what I consider to be our dessert mascot. Am I saying the list is lacking? It’s a tough one to call, but definitely. To understand why FroYo feels so distinctly L.A., we must travel back to 2005, when the country’s first ever Pinkberry opened its doors right here on Huntley Drive. Hye Kyung Hwang and Young Lee’s simple, supertart recipe reignited our country’s fascination with the idea of “healthy ice cream” (the craze first swept the nation in the ’80s, aka the era of TCBY). Angelenos are nothing if not weight conscious, and so we flocked to WeHo for a sugar fix we could all feel OK about the next day. 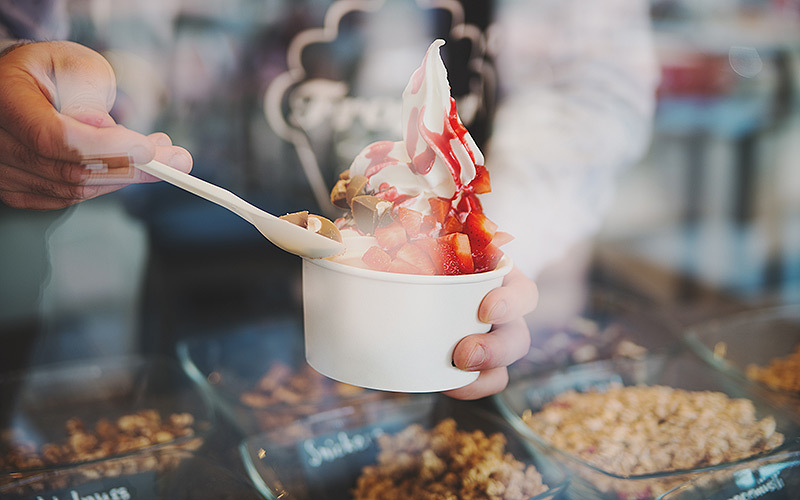 Pinkberry set off a FroYo blitzkrieg, paving the way for chains like Yogurtland (whose first store opened in Fullerton in 2006), Tutti Frutti (started in SoCal in 2008), and Menchie’s (whose first store opened in the San Fernando Valley in 2010). And while those chains have some redeeming qualities, the fact is there are a few old stalwarts and newer single-store operations that contribute to L.A.’s overall FroYo landscape, which is just one of many lenses through which you can become intimate with our vast metropolis. So how well do you know this town based on its pumpable frozen offerings? Let’s go down the FroYo rabbit hole. Yogurtland: Y-Land (no one calls it that) is fine, but it suffers from an inconsistent product. If you’re going to have a spectrum of standard flavors—New York Cheesecake, Double Cookies and Cream, Brownie Batter, etc.—on tap, those flavors better blow my mind. Menchie’s: Menchie’s does for Big FroYo what Yogurtland cannot: it manages to be brilliant at the basics (simple flavors, standard toppings). But it’s still Big FroYo. Pinkberry: While the brand is inherently “so L.A.,” eating there is not. You needn’t have lived here for more than five minutes to know that Pinkberry is as available as Starbucks—which, admittedly, is a plus for those who are either hooked on their trademark tart flavor or unwilling to drive more than three miles in any direction for any reason. But at the end of the day, Pinkberry is like the chips and salsa at a Mexican restaurant: you’re only eating it because it’s right in front of you. Tutti Frutti: This is the type of FroYo you get when you’re at a mall. Or because it happens to be next door to your Chase branch. Penguin’s: The Thousand Oaks-based FroYo-ery opened in the early ’80s and had 123 stores across L.A. in its prime. Now it’s down to only three franchises (we’d recommend the one on Westwood Boulevard). Red Mango: Transplants can relate to this chain, which is itself a transplant (the first one opened in South Korea in 2003). There are only two in L.A. (both downtown). Yoga-Urt: Do you know where to find vegan FroYo off the top of your head? Of course you don’t. Glendale’s Yoga-Urt has a pretty impressive menu of non-dairy flavors named in accordance with the store’s Namaste atmosphere (Tantric Tart, Peanut Butter Prana). Whipp’d LA: There are purportedly only three places you can get Dole brand pineapple soft serve: the Dole plantation in Hawaii, the Tiki Room at Disneyland, and Whipp’d LA/Whipp’d OC. None of us are driving to Orange County, nor are we braving the crowds at Disneyland, NOR are we buying a plane ticket to Hawaii in the name of FroYo. Which is what makes Whipp’d LA so special. Menchie’s: We meet again! Little known fact: all of the chain’s flavors are kosher, and they’re tastier than other kosher purveyors (like Milky’s). So hats off to you if you eat there specifically for its parve options. The Bigg Chill: Right across the street from Penguin’s in Westwood, The Bigg Chill has ridden out the nouveau FroYo wave since the ’80s (’87 to be exact), and its neon pink-and-turquoise décor have long been a draw for decades-long customers. Like Humphrey Yogart, the old school spot has counter service, and they don’t mess around with designer flavors like Taro or Green Tea. If it’s delicious simplicity you’re after—Vanilla Custard, Fresh Strawberry, P-Nut Butter, Honey Greek—this is your spot. Yogurt Stop: You’ve achieved FroYo enlightenment if you’ve eaten at Yogurt Stop in West Hollywood. And once you have, it’s unlikely another fro-sperience will take its place. You may still patronize other shops, sure, but no toppings bar matches the one at Yogurt Stop, which offers 55 options. The sheer breadth of its accouterments would be enough to set Y-Stop (no one calls it that) apart from its competitors, but consider this: several items on the bar—moist chunks of banana bread, sweet carrot cake, fudgy brownies, thick-cut cookie dough—are all baked in-house. Say what! Their yogurt offerings are equally impressive. Ten rotating flavors are available each day, ranging from tart fruit options like pomegranate and mango to creamier flavors like salted caramel and an inimitable red velvet. Yogurt Stop is the type of joint that you find out about because a local recommends it, the same way a Chicagoan would send you to Pequod’s over Uno’s for deep dish pizza. If you haven’t been, now you know. Go forth and pump the most L.A. FroYo L.A. has to offer. As an adult, I try to keep a glove on my cake slice preferences. Especially in public. But it’s one of those third-rate gloves from Wal-Mart that are sold in packs of five because they disintegrate when exposed to the elements and don’t really keep your hands warm. All of this to say, I still demand corner slices. Marielle Wakim is the Arts and Culture Editor at Los Angeles magazine. She went viral once, which is not how she thought she’d spend her 15 minutes of fame, and she’d be much obliged if you’d remember that with extra sprinkles comes extra responsibility. You can follow her on Twitter @mariellewakim, on Instagram @marielle.m.n.o.p, and on her website. She wrote Let’s Explore the Shockingly Honest Dating Deal Breakers in L.A.